"Someone get Bronson a Red Bull!" If you look up "strong, silent type" in the dictionary, there's a picture of Charles Bronson next to it. You want a tough guy in your movie, you gave Chuck a call. Few actors had the phrase "...But They Pushed Him Too Far!" associated with their name more. Whether he was dishing out vigilante justice or just sitting down to a bowl of corn flakes, the craggy slits he calls eyes remained cold and divulged nothing. That being said. . . I could never get past the voice. The blocked-nasal croak of Bronson never sent chills down my spine. Occasionally I'll hear an impersonation of him on 'The Simpsons' ("Hey there pally! This ain't ovah! "), and the voice sounds right to me in this comedic setting. But it never worked for me as "The Voice of Justice". I guess that's why the "Death Wish" franchise never caught my fancy. Maybe the fact that Bronson is strong but more silent than usual in "Hard Times" made it more appealing to me than his other works. Chaney (Bronson) just got to town and, like so many during the Depression, he's looking to make a buck. I'm guessing work as a mime would be the first choice for the tight-lipped Chaney, but bare knuckle brawling is probably a close second. He's got $6 to his name and he wants to at least double it, so he seeks out the nearest back-alley fight scene. He finds a backer in Spencer 'Speed' Weed (Coburn), a fast-talking, big smile-type that makes Chaney all the stonier by comparison. A fight gets set up and Chaney drops his opponent with one punch. Speed sees that this could be his big chance to make some serious money, getting some long odds on an unknown, older (Bronson was in his early 50's when they filmed this) fighter who punches like a mule kicks, so they head off to where all the high rollers in the street fighting game reside, New Orleans. Once in the Big Easy, Chaney and Speed meet up with Speed's associate, Poe. It seems Poe's main contributions to the partnership are a small amount of money, some minor medical advice, and the requisite amount of creepiness needed from your supporting cast. Poe, played by Strother Martin, spends the entire movie in a Colonel Sanders suit and white fedora, and seems to be channeling Peter Lorre at times. It's established early on that he's a drug addict, which would explain the lack of blinking and the perma-grin he sports throughout. An eccentric character like Poe only serves to make Chaney seem EVEN MORE stoic, approaching Easter Island Head-territory. The whole gang gets to work, and Chaney lives up to his potential, knocking out the toughest guys in town. Speed makes a killing with Chaney, but, predictably, he manages to gamble it all away. Speed gets deep enough in the hole that the less savory elements of the street fighting community of New Orleans (i.e. - everyone) decide to kidnap him and hold him captive until Chaney agrees to fight a ringer that they've brought in from Chicago. At this point you'd think the gangster-types in the movie might have finally "Pushed Him Too Far! ", but truthfully, Chaney doesn't seem very pushed at all. Bronson plays Chaney about as strong and silent as would seem humanly possible. He looks like he's perpetually just waking up from a long nap; hair tussled, bags under the eyes. And the events of the movie, whether it's the kidnapping of Speed, or the tacked on romantic subplot (the romantic interest is played by Bronson's real-life better half, Jill Ireland), rarely get more than a sentence or 2 from Chaney. But make no mistake. . this is one tough dude. 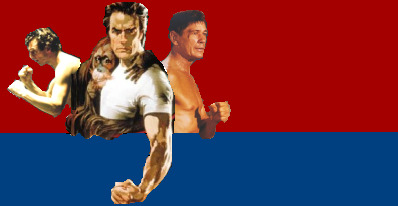 Bronson is physically imposing, and his totem-pole disposition makes for a believable streetfighter, even when he's fighting men twice his size. This part of the film works. Chaney definitely evokes the image of the "nameless gunfighter" that you'd find in westerns; coming into town to right the wrongs. And Speed, Poe, and the rest of the thugs show the correct amount of awe and fear of such an enigma. But, as I mentioned earlier, they try to shoehorn a romance into Chaney's life, and it doesn't work. There's absolutely no plausible way that a sadsack like Chaney could pull a babe of Jill Ireland's caliber, short of her being a prostitute (which they hint at, but by the end it seems more like Chaney and her are dating or something). The dialogue between them is laughable, and this subplot ends in a very unsatisfying way. This was a fightin' movie, and that's how it should have remained! Seeing guys like Bronson this week and Clint Eastwood from last week who were in ridiculous shape in their 50's makes me feel even worse about not going to the gym in my 30's. Chuck Bronson looked perfect in his role; definitely not the kind of dude you'd want to meet in a dark alley. The film gets points for above average fight choreography as well. There were a few kicks that looked a little out of place, and some of the combos were a little too well timed, but it didn't diminish what were some fantastic brawls. The settings were great as well, the best being the fight at what looked like a refinery against the gangster's best guy, Jim Henry. Henry was played by the late Robert Tessier, whose bald head and familiar face I couldn't place for the life of me. A quick look at his IMDb page sparked my memory; he was 'Shokner' in "The Longest Yard" and he played one of the bikers from the big brawl in "The Cannonball Run". He's also an accomplished stuntman, as was Nick Dmitri, the actor who played the gangster's ringer from Chicago named Street. My only criticism of the fighting (and it's a minor one) has to do with Tessier and Dmitri. I know that fans of the film are going to disagree, but I honestly thought these 2 should have switched parts. I can understand bringing in the ringer from Chicago and having him try to out-'strong and silent' the Chaney character, but Tessier was such an impressive physical presence in the film. Dmitri is an unbelievably tough guy, but having the big, bald, tattoo-covered bruiser in the finale would have worked better in my mind. 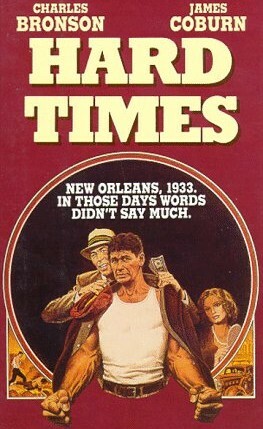 'Hard Times' was Walter Hill's first directorial effort. Hill has gone on to write and direct some spectacular films (he co-wrote one of my favorites, "Aliens", with James Cameron, and his cult favorite, "The Warriors" will definitely be reviewed here someday). While Hill didn't write 'Hard Times', you can see that this film made an impression on his future endeavors. Not too long ago I reviewed a later Hill effort, Undisputed, and my main critique of his work in that film was how broadly the characters were presented. 'Hard Times' certainly isn't an in-depth character study either, but the cast made it entertaining. I guess the bottom line is, if you're going to people your story with shallow stereotypes, make sure you have the actors to pull if off. Strother Martin, James Coburn, and Charles Bronson make this a fun movie to watch.